Long-term projections for the lucrative global construction equipment market had been rosy enough to attract record crowds to the 2017 ConExpo in Las Vegas this week. 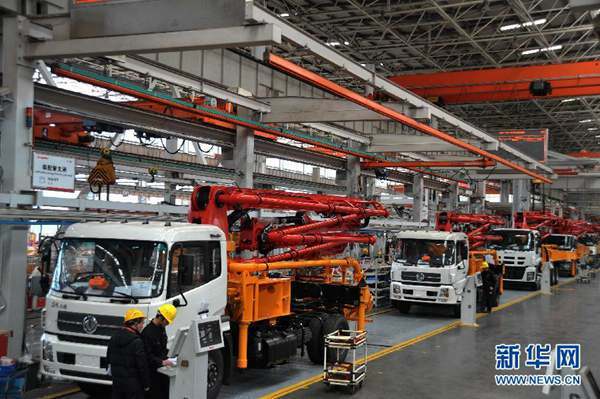 "The recovery is here and we are offering amazing incentives to buy," Sany America's Marketing Director Tim Rogers told Xinhua Thursday. Rogers pointed to a 5-year, 5,000-hour warranty package unveiled this week by Sany as just one new incentive offered by his company. Sany is been described as the Caterpillar of China, the No. 1 construction company in the country, with revenues close to 7 billion U.S. dollars for 2016. Industry projections released this week by Britain's Off-Highway Research was data the Chinese construction equipment industry had been awaiting and expecting. With sales expected to jump from 70 to 90 billion U.S. dollars in the United States by 2020, 2,600 companies from around the world lined up in the Nevada desert to show their steel for a piece of the pie. While China's big equipment producers -- Sany, Zoomlion, and XCMG -- burst into the global "Top-10" producers in 2012, their entry into the American market had been careful and strategic. "We offer a track record of success and a wide array of incentives to attract American buyers," Wan Chun Zhou, Sany's General Manager, told Xinhua Thursday. Zhou, along with other Chinese industry leaders, are confident they can compete in price with other equipment producers. "Cost is just one piece of the puzzle," Chicago distributor Barry Hubscher told Xinhua. "The Chinese will need to offer a broad-based strategy to succeed in the USA." "7-24 hour" service, as well as strict evaluation requirements to expedite service and minimize downtime. Sany also developed a "3-tiered management" plan to insure customers get parts, and a plan to manufacture parts in North America that would also reduce costs to the end user. Likewise, Zoomlion Vice-President Yanming Xiong told Xinhua that his company's focus would be localizing as much as possible, focusing on customer service, and offering consistent innovations in engineering and design as efforts to address customer needs. Both Xiong and Zhou stated this week their companies focused on "research and development" allocating between 5 to 15 percent of revenues toward having their engineers answer customer design suggestions. "People don't realize that the Chinese have been in the construction business for 60 years, and their equipment is used and seen in 170 countries around the world," said Xianbiao Zhou, publisher of China's Construction Industries CMTM Magazine. And while the big Chinese companies may seem like new players in the 200 billion U.S. dollars construction equipment game, their products had been used to build the most modern, affluent country in the world. "When you know that the airplane is going to crash, would you be willing to get on the plane," XCMG's CEO Wang Min told a press conference audience this week. "Chinese products are durable and reliable, and our plan to supplement these excellent products is ambitious," Min said. According to Off-Highway Research, global equipment sales would move from 650,133 units in 2016 to around 810,000 machines by 2021. Specifically, that translates into an expected resurgence in some higher value types of equipment over the coming years, most notably crawler excavators and rigid dump trucks. The Chinese players don't have to look far to find a blueprint for success in America. Japanese giant Komatsu, which stepped into the USA since 1970 along with Hitachi, had 2016 revenues totaling 14 billion U.S. dollars and had been the No. 2 equipment producer in the world for the past 15 years. "We certainly want to be known as a company that prioritizes research and development," said Raleigh Floyd, Komatsu America Corp.'s Director of Public Relations. "But I have to say that the number one thing about Komatsu is dependability, the second is innovation, and the third thing we do is support our customers," he said, "It's all about helping our customers make money." In response to Sany's "24-7" repair strategy, Raleigh said Komatsu works closely with its dealers, "who are our public face to our customers, some dealers do, some dealers don't," he said. Sany Marketing Manager Summer Xia told Xinhua that her company had also recruited Japanese consultants to assist them in entering the American market. ConExpo dates back to 1925 in Chicago, when 15,000 people attended. This year's show brought a record 130,000 attendees with equipment sprawling over 2.5 million square foots (232,000 square meters) of space.